The smallest Mercedes convertible is the SLK roadster. With compact dimensions and seating for two the SLK-Class competes with the BMW Z4 and the smaller Porsche Boxster. Now in its third generation, the SLK has a power-retractable hardtop for year round motoring and security. A variety of models are offered with alphanumeric designation tied to the powertrain. The base model is the SLK250 which is powered by a fuel-efficient four-cylinder turbo. The mid-range SLK350 has a 302-bhp, 3.5l V6 under the hood. 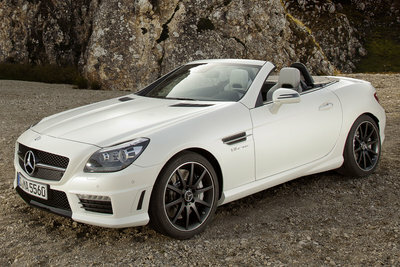 The AMG factory performance SLK55 AMG model equips a 415-bhp V8 engine which is a lot of power for a 3500 lb. car. The SLK offers a unique panoramic roof that can be darkened at the touch of a button.